1+2+3+4=10 is beautiful isn’t it? I don’t know why I find the simple sequence 1+2+3+4=10 beautiful, I just do. It doesn’t have to be ordered in a hierarchy for me to find it so, in fact I think I prefer it not to be, though a lot has been made of it presented in this way, just google tetractys and look at all the images. There are some wonderful paintings and constructions by Natalie Dower exploring the series non-hiererchically arranged. I think it is only when the sequence is arranged as in the diagram that we call it a tetractys (though I could be wrong about that). Apparantly Pythagoras gave it mystical meaning and it has significance in the Kabbalah too (see this website for more information about these mystical associations). The poetry form, Tetractys, consists of at least 5 lines of 1, 2, 3, 4, 10 syllables (total of 20). Tetractys can be written with more than one verse, but must follow suit with an inverted syllable count. 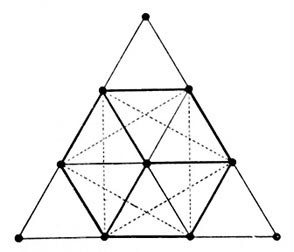 Tetractys can also be reversed and written 10, 4, 3, 2, 1. These two combined together, that is 1,2,3,4,10,10,4,3,2,1 is called double tetractys, it can be further extended to triple or more. and offers some good examples at window2mysoul.